Welcome to our Porch University. Our course, Porchology 101, is designed to provide you, the porch lover, with insightful information you can use for your porch and yard. Mary and I, in response to the myriad of questions we receive about porches and as self-appointed Porch Professors, created Porchology 101. Unlike other classes, ours is free and you don't have to register, pay for books, arrive on time, or take notes. There are no tests so you don't have to study either! We hope you enjoy our short informational videos and invite you to begin by watching our introductory video below. When it comes to selling your home, real estate mogul Barbara Corcoran says that you have just 8 seconds for the person to decide whether they want to consider your home. So first impressions totally count. That's where your front porch comes in. Make it appealing and welcoming. Use your porch to sell your home with these curb appealing ideas. The size of your porch is important. Size does matter but that doesn't mean that the largest porch is the best porch. A patio is one way to extend your existing smaller-sized porch. Have you ever seen a blue porch ceiling? As in haint blue. 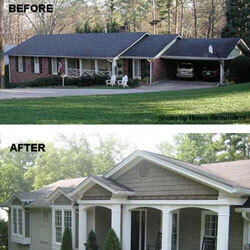 Haint blue porch ceilings are especially popular in the South and there is good reason. We want to share with you the why's of blue porch ceilings. What's Leading Up to It? What leads up to your porch? Attractive landscaping or a whimsical flower garden make a remarkable difference in the beauty of your porch. We have oodles of porch landscaping ideas for you. Beautiful porch trim makes for a fabulous porch - whether vintage or just fashionably dressed-up. Our guest, Gregory Tatsch from Vintage Woodworks, explains how to mix and match porch trim. Read more about Vintage Woodwork's handcrafted porch parts and get wonderful ideas for outdoor house trim here. No need to buy new pillows when the seasons change. Just cover the ones you have - and you can do it quickly with our pillow toppers ideas. Here's one sample tutorial of our pillow toppers - pillow covers for autumn and another, patriotic pillow toppers. If you have a rotting porch column - or simply want to put up new columns, we give you some tips on replacing a porch column. If you want to change out the style of your porch posts, here's an idea from John and Sherry about how they switched their posts from round to square.